You Have Been Accused of White Collar Crime - Now What? I’ve Been Accused of White Collar Crime – Now What? LEWIS & DICKSTEIN P.L.L.C. has stood by thousands of clients facing a wide variety of white collar crime, including cay difficult. Failing to hire experienced, aggressive legal counsel can ruin a person’s entire life, which is why you need to hire a great attorney, guilty or not. White collar crimes refer to any non-violent theft crime or form of fraud usually committed in finance. Common examples of white collar crimes include embezzlement, identity theft, conspiracy, bribery, tax evasion, trade secret violations, and others that are outlined in Michigan legislation 750.218. As evidenced by public figures going to jail for such crimes in the past, we see that no one is exempt from serving jail time if found guilty for these crimes. 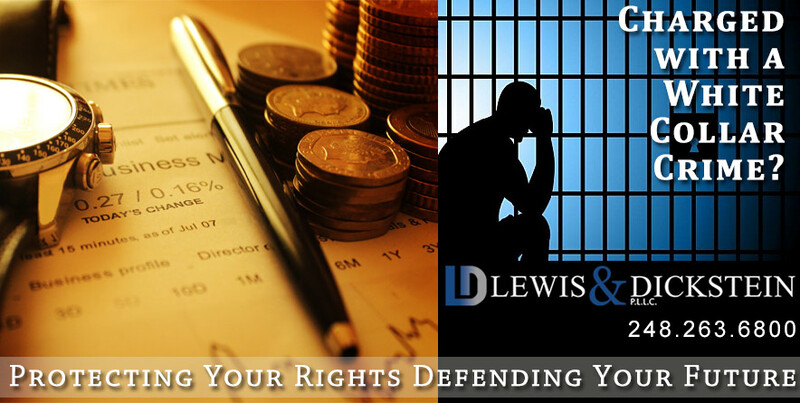 Although jail is imposed frequently for serious white collar offenses, the defense team with LEWIS & DICKSTEIN, P.L.L.C. has an unparalleled track record of keeping clients out of jail and prison, even when other lawyers believe there is no other alternative. Should I plead guilty and accept a plea deal? Before making decisions that will largely determine your future, we recommend contacting well a respected and aggressive Michigan criminal defense attorney who has decades of experience defending white collar charges in state and federal court. Accepting a plea deal may not be in your best interest and a “better” plea deal may be available with a highly effective lawyer. A seasoned attorney who has years defending individuals in your situation can help you explore, understand and decide between all of your legal options. Too many clients erroneously believe that by pleading guilty, they will somehow receive a lesser sentence, which is not necessarily the case. By pleading guilty, you not only risk your professional reputation but freedom as well. If you are facing charges for white collar crime, you are most likely feeling scared, vulnerable, and uncertain about the future. LEWIS & DICKSTEIN P.L.L.C. has represented thousands of individuals facing charges for white collar crimes. If you have become involved in white collar crime to some degree or you are accused of violating a white collar felony or misdemeanor, don’t trust your fate to the lowest bidder. Without judgment and always with respect, the lawyers with LEWIS & DICKSTEIN P.L.L.C. work closely with clients to protect their freedoms and help their lives back on the right path. Call us today for a free and confidential consultation at (248) 263-6800 or complete a Request for Assistance Form and an experienced criminal defense lawyer will promptly contact you.